Dry and Curing for TWP Stains. How long does it take? 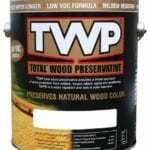 It is good to know the dry and curing time of TWP (Total Wood Preservative) Stain prior to applying. Some people get in too big of a rush and want to start putting furniture, plants, grills, etc. back onto a wood surface too soon after staining. It is best to allow TWP to fully dry and cure before allowing foot traffic and items to be placed on the surface. Drying and curing time for TWP may vary depending on climate and weather conditions. Over application can also affect dry and curing times. TWP should dry evenly flat with no glossy areas. Glossy areas indicate over application of the product and will extend the dry and curing time of TWP. 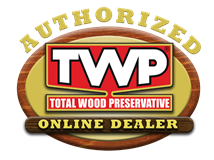 To avoid over-applying TWP, allow the stain to soak into the bare wood for 30 minutes then wipe away or back brush any excess stain that has not penetrated the surface. Do not apply TWP if rain is expected within 48 hours. 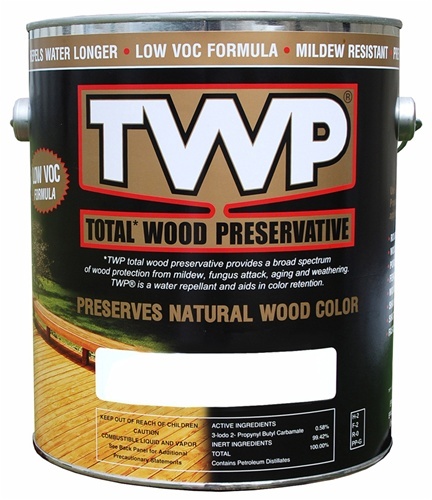 TWP can withstand light rain within an hour or so of being applied but it is best to wait for dry conditions prior to staining. TWP should only be applied when the temperatures are expected to be between 50-90 degrees. It should not be applied in direct sunlight or high heat conditions. This can cause the stain to dry too quickly before it fully penetrates. Moisture can also affect the dry and curing time. It may be necessary to apply TWP later in the afternoon if there was heavy dew the night before. In perfect drying conditions and assuming TWP was applied properly, the dry time ranges from 24 to 72 hours. After an adequate dry time of TWP, foot traffic and heavy items can be returned to the wood surface. 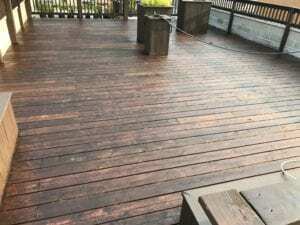 Applying TWP Stain in dry conditions with proper application methods will result in a quick 24 to 72 hour dry and curing time. Applying TWP in ideal conditions and allowing it to dry as fast as possible will also reduce the risk of a surprise rainstorm that may jeopardize the freshly stained finish. Will this product kill or injure my shrubs that are established plantings? You should not get the TWP on any plants. Yes. New boards will be lighter in color as they are less absorbent. They will blend in when you have to redo in 2-3 years, but will not match the first time staining. 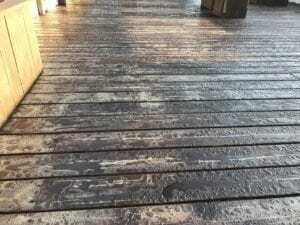 I waited for a 5 day window with no rain forecast to paint my 1000sqft deck with twp1500. Day 3 the chance of rain was 0% at 10am when I started painting. Finished the second coat of wet on wet by 5pm and of course it rained at 7:30pm. Will this likely impact the longevity of the stain? It may wash off the stain and leave it looking blotchy. Post a picture here after the rain water dries off. The next morning I found the oil pooled up. I used wet rags to wipe it away so the sun wouldn’t bake it to the wood. The final picture is how it looks 2 days later after wiping away and letting dry. It is blotchy. Would another coat correct this or do I need to wash it with the bleach solution again and start over? You need to strip it all off and start over. Recoating now will not fix it (make it worse) and bleach will not do anything to prep properly. Is this purely a visual issue or is the ability of the stain to protect the wood also compromised. I might wait til next year or even the following year to take on this project again. Will the stain do a proper job of protecting the wood in its current condition or is that severely compromised as well? If the primary failure is visual only, I might let it weather and wait a season or 2 before stripping it and starting again. You would be fine to wait until Spring to strip and start over but going two years would be an issue. This is a deck on the roof of my building. It is built roughly 1′ above the roof surface. The flat roof below the deck has the typical silver paint finish. Will this stripper damage the roof paint? I had no choice and applied the stain in direct sunlight. I applied 2 coats wet on wet. is my application compromised? You should be fine as long as it dries evenly. 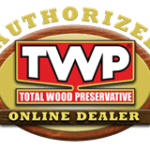 We love the TWP product but we just re-applied the TWP 1500 Stain and it is ponding alot even though we wiped it down and even though it was supposed to be dry next 48 hours we have a some pop up thunderstorms in the area. What should we do? Will this harm the finish? 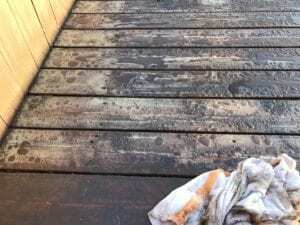 It is a re-coat after two years on the deck floor only. It should be fine if it rains on it by then. Just leave as is. Do you suggest the the weather stay between 50-90 degrees for the entire time of curring (i.e. 50+ in the evenings too)? Currently we are experiencing highs in the low to mid 60’s, but the evenings, overnights & mornings are in the low 40’s. Should i wait to stain until overnight highs are above 50? It can drop below 50 overnight but cannot drop below freezing.